Wanted: a media-savvy imagemaker, good at staging and location shoots. Please apply to White House immediately. What has happened to President Obama? Obama was the guy who commanded the stage, had an instinct for seizing the moment. His image was towering, his timing impeccable. But lately, it seems more clear than ever that what he really needs is another Mike Deaver, who served as White House chief of staff under my father, Ronald Reagan. Deaver appeared in my family's life in 1966, when my father was elected governor of California. His agenda was clear: appearance was crucially important  the settings, the backdrops, the canvas. The idea was that my father would be judged, remembered and evaluated by the visual images Deaver engineered. I wasn't impressed. As a self-described hippie who quoted Martin Luther King, Ram Dass and Eldridge Cleaver, I found what Deaver was doing offensive. I mean, what about the content of a man's character? I huffed. Who cares about backdrops? But today, when it's obvious how distracting, even toxic, the wrong image can be, I'm a convert to the idea of staging the moment. I'm not sure how important my father thought Deaver's precise attention to image was, but he trusted him. The two of them had a bond that seemed nothing short of familial. Deaver was like the loyal son who would slay dragons, go to war or do pretty much anything to lift my father up closer to the stars. He was once quoted as saying, "Every morning after I get up, I make believe I am him and ask what he should do and where he should go." Romesh Ratnesar, in his book Tear Down This Wall, said that Deaver "was the most powerful force in the molding of Reagan's public image," and that "his true talent was stagecraft." Lesley Stahl got a quick tutorial in that when she did a scathing report on the Reagan budget cuts and expected rebuke from the White House. Instead they were all ecstatic. Why? Because the accompanying footage of my father was terrific, showing him to be confident and robust. The question arises  and it's almost an existential one: Does attention to image mean there is less substance beneath the surface? Or is it just a way of revealing the substance beneath and emblazoning it across the collective consciousness of a nation? The legacy of Reagan is such that even his political detractors would probably not dispute his substance at this point. And we do have those soaring images emblazoned in our minds: balloons falling from the rafters at just the right moment at the conventions; a windy promontory called Pointe du Hoc and the soft light over the English Channel as my father honored the 40th anniversary of D-Day; the Brandenburg Gate behind him, framing him, when he said, "Mr. Gorbachev, tear down this wall." Even my father's funeral service at the Reagan Library  buried at sunset, the sky deep blue and orange  had been planned by Deaver. There was, of course, the infamous mistake of Deaver scheduling the 1985 visit to a cemetery in Bitburg, Germany, where, unknown to him initially, SS officers were among the dead and buried. My father went out of loyalty to his friend, refusing to bring more shame on Deaver than was already there. For better or worse, that image is part of the Reagan legacy as well  the stark, snowy landscape, my father's head bent in prayer, surrounded by the graves of men who don't deserve prayer. So, even a maestro of the media can blow it sometimes, as Deaver did with Bitburg. But he would never have allowed President Obama to spend time on the golf course during the BP oil disaster. Hitting the links while millions of gallons of oil are destroying fragile ecosystems, killing wildlife in slow, excruciating ways, destroying people's lives? He'd have hog-tied him in the Situation Room if he had to. Going on a colorful trip to Brazil with the family at exactly the same time that Japan was suffering through a nuclear disaster, Libya had been bombed, and there was a threat of a government shutdown? True, there were some meetings planned in Rio, but maybe it's not the best time for them, Mr. President. Let's reschedule. Stay in the Oval Office and look somber. 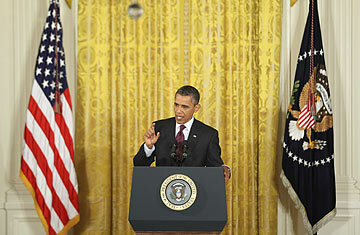 Recently, in the midst of the embarrassing debacle over raising the debt ceiling, President Obama addressed the nation. He walked down the long, red-carpeted hallway in the White House, gold-leaf chairs behind him and stood at a podium, asking us to call our Representatives. Jon Stewart did a hilarious and all too poignant commentary on the setting and the message. He said the setting looked like the foyer of the Vatican  is that really appropriate? And why are we being asked to call our Representatives? "Did the President just quit?" Stewart asked. Deaver would never have allowed it. He'd have designed the setting, worked on the message, the wording, and you know what? We might have felt a tiny bit better. Ultimately, a President's actions and decisions are what make up his legacy. But it is true that we are imprinted and influenced by images. Our brains snap photographs, and they don't fade easily. That's what Deaver, who died in 2007, understood. If there were a way to go to Central Casting and find such a person for President Obama, it would help him enormously. Then again, a casting call probably wouldn't be good for his image. Davis' memoir, The Long Goodbye, has just been released as an e-book.